Starting Dolson at PF make it look worst than it really is. 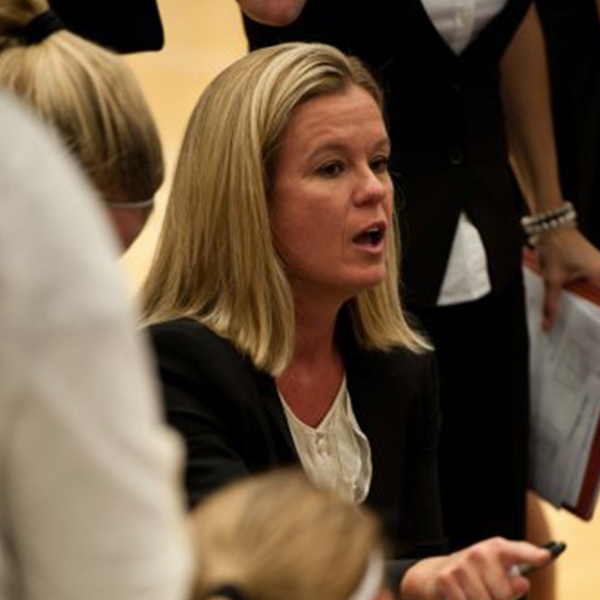 Mitchell joins Head Coach & General Manager Amber Stocks’ staff after most recently serving as the Head Coach at the University of California at Santa Barbara for four seasons. Prior to UCSB, Mitchell spent 10 seasons at Rutgers University. Under the tutelage of Hall of Famer, C. Vivian Stringer, Mitchell helped direct the Scarlet Knights to NCAA berths in nine straight seasons. This might be a hint that Laney isn't going anywhere. CHI now has three Rutgers players: Pondexter, Laney, Copper. I'm now wondering why they didn't go for Vaughn instead of Dolson. Yeah, age.... I know. Could CHI be keeping their eye on the waiver wire for Hollivay? Reunite Faulkner with Pokey and get Poison Pill in return? Gotta stick with the Rutgers theme. I'd do Jonquel Jones for #2 in a heartbeat as a Sky fan. I know the Sun wouldn't even consider that deal though..
Hell yes. Do this yesterday. Throw in #9 as well if they want it. Carlene Mitchell pretty much destroyed the UCSB program in her four years -- don't know how much that means at this level, though. curious who Chicago's looking at for #2(Plum?, DeShields?). I think they also let Breland go somewhere else. At this point chicago should just trade Cappie for a draft pick(#6 or #4 pick)or young player with upside(Howard).Cappie has reached her peak but she can still help a title contending basketball team. I think that is right. Trade Cappie to a contender that she could help in a smaller role and go full rebuild. Exactly....how can you effectively develop a young SG if Cappie is playing 27+minutes per game.Not acquiring Meesseman as part of the Delledonne trade has put chicago in rebuild mode. No, the Sun wouldn't consider that deal. Miller stated that he had offers for Jones from every team and said no to them all. She'd most likely be the #1 draft pick if she were graduating this year instead of last. No, the Sun wouldn't consider that deal. That's why I said it before anyone else could. It'll be interesting if the Sky opt to keep Dolson or potentially trade her for a SF or PF. Thoughts? I assume they got her to keep her. I'm not sure Boyette will ever be able to play more than 20 min/game so they need a solid 2nd 5. Guessing they're hoping Breland/Dos Santos will be adequate at the PF. While I don't think much of T. Young as a starter, Pokey obviously did and perhaps Stocks does as well. I'm not convinced they actually think they need a SF. They're hoping one of the Rutger girls works out for that position, at least as a backup...and perhaps they think they can play Laney and Copper together as the 3/4 (like they were at Rutgers) at least in a backup capacity. Personally I think both of them have pretty good potential. We'll see how they develop. I assume they got her to keep her. I'm not sure Boyette will ever be able to play more than 20 min/game so they need a solid 2nd 5. Guessing they're hoping Breland/Dos Santos will be adequate at the PF. While I don't think much of T. Young as a starter, Pokey obviously did and perhaps Stocks does as well. I'm not convinced they actually think they need a SF. They're hoping one of the Rutger girls works out for that position, at least as a backup...and perhaps they think they can play Laney and Copper together as the 3/4 (like they were at Rutgers) at least in a backup capacity. Copper is the bigger of the two and played PF in college. Not saying they will put her there for long stretches, because I think Breland and Dos Santos and perhaps Parker will be the PF. I absolutely love Copper but shes a bit on the Thin Side to be guarding the likes of EDD and or Messeman though ? Mostly my point was in answer to the question about keeping Dolson. I think the Sky roster is pretty much set. They have 5 posts, 3 SF, 4 good guards. I assume they take another guard at #2 and whoever they get at #9 will likely have a hard time making the roster unless she can compete with Parker/Dos Santos/Laney. I say trade, or at least shop. Center is their lowest need with Boyette a future all-star and 3 others on the roster behind her. Three of the four Chicago centers from 2016 are more mobile than Dolson. If they cut her, I would say drop Ericka de Souza, since she most closely mirrors Dolson, but it looks like they already have. She does not appear on their roster. I'm guessing that Dolson and Boyette will be playing together. Dolson will be in the high post on offense, and Boyette the low, Boyette will guard the rim, or the other teams best post. Let say Chicaco is playing Seattle Boyette will be on Stewart, Dolson on Swords, against Ny Boyette on Charles Dolson on Stokes or Vaughn. Even though they are both technically center Dolson has the skills on offense and Boyette on defense that they can still work together on the court IMO. Yeah, I agree. I think Copper is more of a 2/3 at this level than a 3/4. Rutgers only used her at the 4 to help attack zone defenses, much as they used Laney they previous season. The Sky have enough power forwards if dos Santos and Parker are retained with Breland.